No filmmaker besides Martin Scorsese, probably, uses music so well as Cameron Crowe does throughout his career. That’s probably why Almost Famous rang so true when it opened and rings true today. It wasn’t only a film about criticism, journalism and coming-of-age, it was a film about rock and roll. Now he’s taken his love of both music and film and put together a list. He tries to stay at ten but can’t help it and goes to twenty. Some say the lyrics of a song should never comment on the scene. This is not one of those times. The world crumbles, and of course, David Fincher knows the precise song to turn out the lights to. 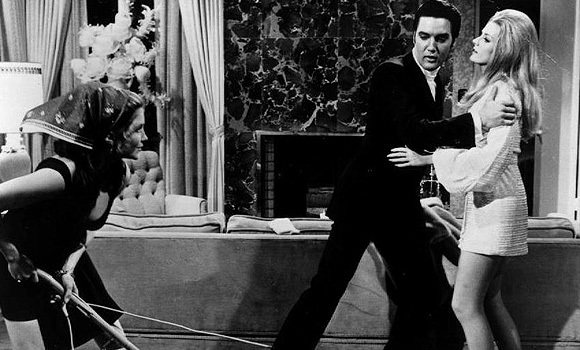 Many credit the Colonel for steering Elvis into his (arguably-cheesy) 60′s movie period. Actually it was Norman Taurog who defined and perfected the so-called Elvis Movie that became the King’s bread-and-butter after the more authentic Lovin’ You-Jailhouse Rock-King Creole phase. Taurog ended all that with G.I. Blues and went on to shoot eight more Elvis kissing-dancing-loving classics. The rootsy early E was never to be seen again on the big screen, but in its place was a riveting run of films that showed Elvis literally walking through movies at a pace of three a year. Every once in a while, true genius would come shooting through. Elvis’ weariness and unpreparedness sometimes created seismically funny and unintentionally profound sequences like this one. Turn it up and groove out to E’s only true foray into psychedelia. It’s no “She Said She Said” but it’s appropriately trippy and you can’t quite believe it exists. Of course, I had to start with Cameron Crowe’s own musical references and how those beloved songs refer back and weave through the film so well. I’m cheating all over the place. Not making a list. Not sticking to one song. Say Anything – In Your Eyes by Peter Gabriel, maybe the most famous scene ever, maybe the best ever use of a rock song with a movie. 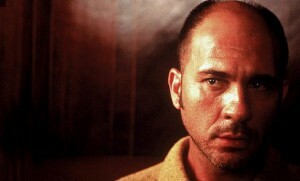 Jerry Maguire – Secret Garden by Bruce Springsteen threads throughout the film but eventually had deep meaning. Free-falling by Tom Petty is also a pivotal song, meaningful to what’s happening internally. Almost Famous – Tiny Dancer, used to fuse the band together when they fall apart. Ma Cherie Amour, the great OD scene when Patrick Fugit realizes he is love with Kate Hudson. Fast Times at Ridgemont High — I love the way Led Zeppelin’s Kashmir is used in the film. High Fidelity – Most of the Time by Bob Dylan used to show how John Cusack is mourning his girlfriend. Since music and movies are pretty much my life I knew my list would be long and unruly. Like Mr. Crowe, I think I’ll start thinking about this and maybe start to harvest a really good one. This is kind of all over the place. But not enough filmmakers are smart enough about music to really use it well. A few of them do – Cameron Crowe hovers right up near the top.